The living dead are back and they mean business in Nothing Left to Ooze, book five of John Kloepfer's sidesplitting Zombie Chasers tween series, with illustrations by David DeGrand. 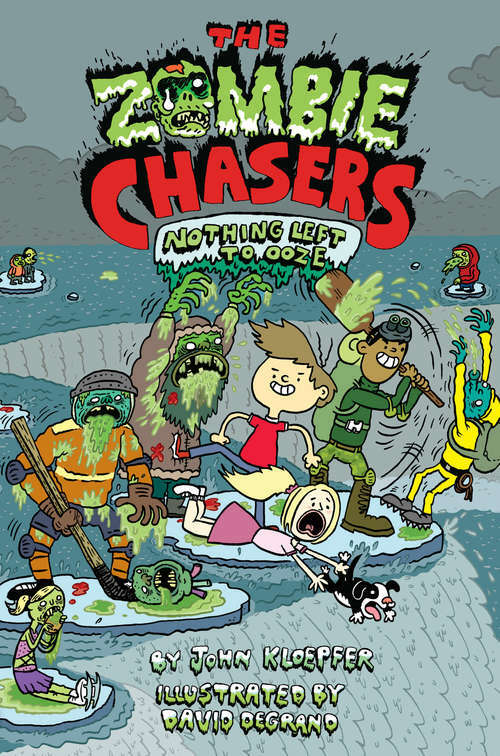 Loaded with middle school shenanigans, fast-paced adventure, hilarious black-and-white drawings throughout, and--of course--a slew of brain-gobbling ghouls, The Zombie Chasers #5: Nothing Left to Ooze is the perfect pick for fans of the series and zombie aficionados everywhere!After the original antidote wears off and millions of Americans suddenly rezombify, Zack Clarke and his crew of Zombie Chasers are on a mission to find a lasting cure. But to stop the undead for good, they'll have to track down a brand-new Zombie Chaser first!Hitting the road again, the Zombie Chasers set out on a zany international expedition where they'll have to plow through abominable snow zombies on the Niagara River and outrun slime-drooling thrill-seekers at the biggest and best amusement park in the country! With rotting fairy-tale princesses and half-dead vacationers, it's not just the Tilt-a-Whirl that will make them woozy. Can the Zombie Chasers end this carnival of frights before it's too late?